I spend a lot of time creating art and thinking about the process of creating art. Lately, I've also reconsidered why I make art. When I was a student in art school, this is something we were encouraged to consider, along with who our audience was and all the technical points one learns when studying under a mentor. Having spent the majority of my life making art, I think it's time to revisit why I do it. It's been 20 years since art school and I find myself wondering if my audience has changed, if my motivations have changed and if I need to alter my techniques. It's fair to say that I'm always pushing myself and I'm my own harshest critic, when it comes to technique and style. The work evolves as it should, as long as I'm mindful of the techniques and style I wish to present. Most artists will tell you that they create art for themselves and while I will agree with this, there is also the part that needs to consider marketing, if youre a working artist. I've worked as a designer to others' specifications and wishes. As a freelance painter, I pretty much do the same thing -- the client tells me what he wants, we discuss details, and i execute the work. If I'm lucky, I might get the odd client who says, "paint whatever, as long as its got fairy wings and the color pink, " but for the most part, I adhere to the paying client's wishes. I do create work solely for myself. It is, afterall, how we all start out with crayon in hand. Recently, I've returned to abstract painting which would, on the surface, seemingly have nothing to do with fairy and fantasy art. But I paint a lot of emotional work and dreams which also inform greatly those same fairies and mermaids. The short answer to my musing, "why do I still create" is because I have to. Painting is my voice. Without this form of expression, I would be mute. I create stories with words, as well as paintings, but it with a paint brush that I am most expressive and verbal. Often I feel as if I'm not being heard when I use my voice or that I've chosen my words poorly. So, a painting, its image or style or even medium conveys my thoughts most clearly. At least to me. Sometimes, that's just fine -- that I have created a work which I understand. Someone else will always give it a new meaning. Have you considered why you create? For whom? Is it a job? Is it divine motivation? Is it therapy? Let me know what you think. This week, I'm taking inventory and adding more prints to my stock, since several sold at Carroll County Art in the Park last weekend. I had a great time at that event, and always do. I 'm also working on a large painting which we've tentatively called The Grey Lady, simply because there's a lot of grey in the painting so far. This work keep getting delayed because of show preparations and commissions, but I do hope to finish her in the next few weeks. Cleaning the studio is an ongoing chore. It gets a little out of control when show season arrives, so I'm trying desperately to keep things in order as I continue working finding space for prints to dry is tough. As many of you already know, I do most of my daily postings on Twitter @KellyBarrettArt and Facebook www.facebook.com/mystwood, but I like to keep a blog for larger topics or some singular issue that's been on my mind. I'm not much of a blogger at this stage and would LOVE your input on what you'd like to see me write about: Perhaps, a tutorial? My history of painting? Edgar Allan Poe? You let me know and I'll give it a try. I know it's been ages since I've blogged. I do most of the daily updates on Facebook and Twitter, but want to keep things going on my blog for larger events and chattier news. 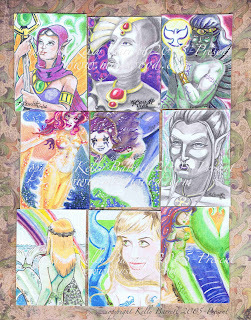 Since my official website www.mystwood.com has reached 23,800 hits, I am giving away a set of 9 ACEO (2.5"x3.5") LIMITED EDITION prints. I make only 9 of each image, so there are very few to go around. 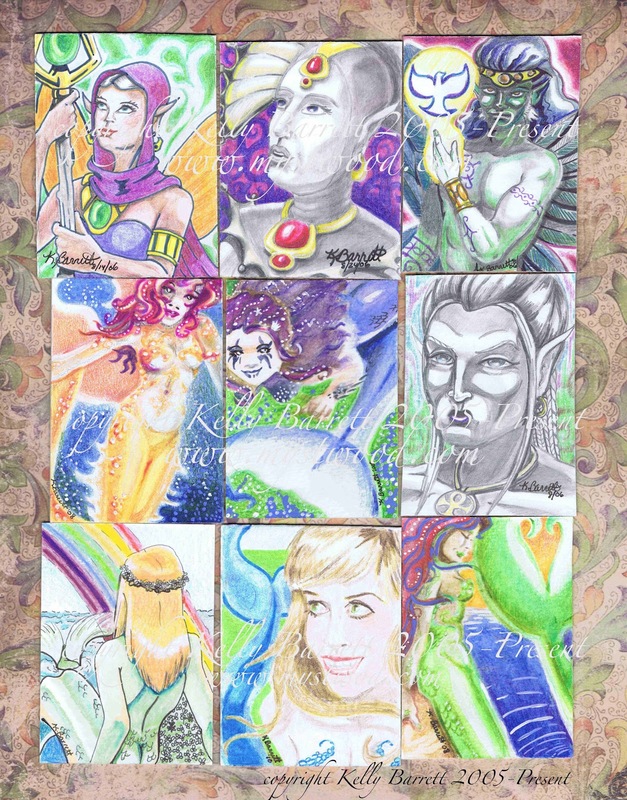 Be the 9th email to kellyb@mystwood.com with the Subject Line: APRILGIVES and this fantastic fantasy set of mermaids, elves, and magick users is yours! Timestamps will determine the order of the emails and the winner, if there's a tie. THANK YOU for visiting my site and for all of your support. I appreciate each and every one of you! Thank you to everyone who continues to support me, from family to friends to other artists and fans! I appreciate your encouraging words and positive feedback. I am looking forward to new art, new projects and a better year in 2012. I will be contributing more to my blog this year, in addition to keeping up with Facebook and Twitter. Regular updates to my site with new art, events, contests and info. are always on-going. Let me know what you'd like to see in 2012!